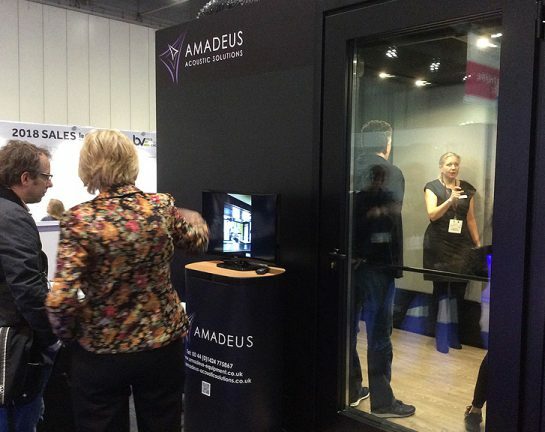 The Amadeus Acoustic Solutions sales team are still nursing their aching feet after an extremely successful three days demonstrating their BOXY modular studio at BVE 2017, which took place at the London ExCeL centre 28 Feb – 2 Mar. Although BOXY creators, B-BEng, have established a firm broadcasting pedigree in Europe, this is the first time that exclusive UK distributors, Amadeus, has officially introduced the incredibly popular modular build system to the UK TV, film and radio world; and the team were thrilled by the excitement that the demonstration room generated. Installed in just 2½ days, the 3m x 4m BM series modular studio enjoyed perpetual activity as representatives of the broadcasting and production industry queued to experience the room’s environment and test its performance. Time after time eyebrows were raised as the 280kg door was swung shut, cutting out the hubbub of the busy, buzzing exhibition and the exceptionally ‘dry’ sound space was fully appreciated. 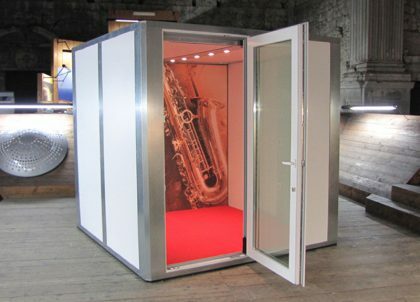 If you would like to learn more about our BOXY modular studios for broadcast – click here.